Evolution Motorsports ClubSport Intercooler Kit PORSCHE - Dezod Motorsports Inc - Home of the automotive performance enthusiast since 2002. 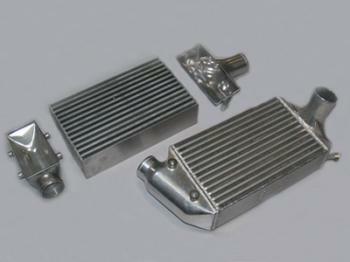 Evolution MotorSports continues to lead the Porsche performance aftermarket with new and innovative productsEvolution Motorsport ClubSport Intercooler cores are 25% larger than the OEM cores and have a flow rate 36+% higher measured on an independent SF1020 flow bench. Evolution Motorsport ClubSport Intercooler Kits help achieve quicker boost and adds an overall power increase as compared to the OEM intercoolers. 3-D CAD designed cast aluminum / CNC machined end tanks offer maximized airflow and efficiency. The lengthy R&D process, stringent testing and manufacturing procedures allow optimized results with impeccable quality and performance. For the ultimate in performance, choose optional SWAIN coating – up to 15% increased efficiency and a stealth black coating.